The Kansas high school football season has crossed over the mid-season point and movement in the Kpreps rankings is starting to stabilize. Check out the Kpreps Rankings for Week 6! Lawrence Free State stays atop the Class 6A poll after a 31-6 road win at Olathe South behind 180 rushing yards and three touchdowns by Jax Dineen. The Firebirds lead was 14-6 at halftime, but the defense held the Falcons off the scoreboard. Olathe South’s lone score came on a 96-yard kickoff return by Jamison Phelps. Shawnee Mission East remains in the No. 2 spot this week after a 59-6 win over Shawnee Mission North. Parker Willis made state headlines by connecting on a 56-yard field goal in the game – the second longest in state history. The Lancers be on the road this week at Olathe East. Derby won the battle of No. 3 ranked teams by holding off 5A’s Bishop Carroll, 54-45. The Panthers built a 16-point lead in the second quarter and got a late turnover and touchdown after Carroll had pulled to within 47-45. Quarterback Grant Adler rushed for four touchdowns in the game, while Brody Kooser added two more scores. Wichita Northwest moves up one spot to No. 4 this week after 26-14 win over previously-unbeaten Kapaun Mount Carmel. The Grizzlies trailed 14-13 at halftime but shutout the Crusaders in the second half. The 26 points scored were the fewest scored in a Grizzly victory since a win over Wichita East in 2013. Manhattan enters the top five after a 27-9 win over Topeka Seaman. The Indians have won four consecutive games after a three-point loss to Shawnee Heights to open the season. Manhattan will take on rival Junction City this week in the battle for the Silver Trophy. Goddard remained unbeaten with a 38-0 shutout of Salina Central, incredibly handling the traditional power its 14th consecutive defeat. The top-ranked Lions have only allowed a total of three points in their last two games. St. Thomas Aquinas defeated two-time defending 5A champion Mill Valley 42-21. The Saints defeated the Jaguars 40-33 during the 2016 regular season before Mill Valley won the rematch 14-13 in the state semifinals. Aquinas will host No. 4 St. James Academy this week in a key Eastern Kansas League showdown. Bishop Carroll remains in the No. 3 spot this week despite the 54-45 loss at Class 6A No. 3 Derby. Braden Howell passed for 472 yards and four touchdowns to lead the Eagle offense, but Carroll managed only 51 yards rushing on 32 attempts. Carroll maintains the No. 3 spot just ahead of No. 4 St. James Academy. The Thunder picked up an impressive 35-28 victory over then 6A No. 4 Blue Valley. Jack Petz rushed for five touchdowns in the game as St. James built a 21-0 lead and held off the Tigers. Wichita Heights returns to the 5A poll this week after three consecutive impressive victories. The Falcons lost opener at Olathe North and to Wichita Northwest in Week 2, but played without their starting backfield. Since those players have returned, Heights has averaged nearly 59 points per game. The Falcons have big tests at Kapaun Mt. Carmel and against Bishop Carroll in the next two weeks. Bishop Miege improved to 5-0 in cruising to a 51-7 win over Blue Valley West on Thursday night. The Stags wrap up the Eastern Kansas League portion of their schedule this week at two-time defending 5A champion Mill Valley. A victory would guarantee Miege at least a share of the EKL title. Second-ranked De Soto went across state lines and picked up a 55-14 victory at Nevada (Mo.). Wildcat quarterback Bryce Mohl passed for more than 250 yards and four touchdowns in the win. Trevor Watts and Connor Strouse were each on the receiving end of two Mohl touchdown passes. Buhler remains ranked third this week after the Crusaders’ 40-0 shutout of Winfield. Buhler will travel to Augusta (4-1) this week with a chance to remain tied atop the AVCTL-III standings. Maize South dominated Mulvane 42-6 on Friday. The Mavericks were led by Max Dominick’s 144 rushing yards and three scores. Mulvane all-state quarterback Jayden Price did not play in the game. McPherson cruised past Towanda-Circle 62-7 to remain ranked fifth this week. The Bullpups will take on Rose Hill this week. Columbus continues to hold off Pratt and Scott City atop the Class 4A, Division II poll this week. The Titans raced out to a 47-0 halftime lead in beating Prairie View, 47-14 on Friday. The Titans will travel to Abbey Field to take on unbeaten Galena this week in a game that will decide the CNC League title. Second-ranked Pratt rallied in the second half to win at Hoisington, 35-28. The Greenbacks jumped out to a 20-6 lead in the second quarter, but Hoisington returned an interception for a touchdown to lead 22-20 at the break. That lead increased to 28-20 in the third quarter, but two Pratt touchdowns helped the Greenbacks avenge their only loss from the 2016 season. Scott City picked up a dominating 42-11 win at Ulysses. The Beavers remain ranked third this week and will host an improved Wellington team this week. Nickerson moves up one spot to no. 4 in this week’s poll after a 27-7 win over Larned. The Panthers victory over the Indians is particularly impressive given that Larned came in averaging 36 points per game. Nickerson will get another Central Kansas League test this week when the Panthers host Hoisington. Finally, Holcomb moves back into the top five at No. 5 after a 27-0 victory over previously-unbeaten Colby. The Longhorns take on another unbeaten team this week when they visit Lakin. Nemaha Central passed a tough test with a 13-0 victory over Centralia. The Thunder scored all 13 points in the first half and held off the Panthers. Nemaha Central gets another tough test this week when the Thunder take on Perry-Lecompton. Second-ranked Phillipsburg continues to mow through Mid-Continent League opponents. The Panthers defeated Ellis 69-13 on Friday and will travel to Larned this week. The Panthers dominated Larned 50-0 during the 2016 regular season, then escaped with a 14-7 win over the Indians in the 3A playoffs. Silver Lake remains ranked third this week after a 14-0 victory over rival Rossville in the “War on 24”. The Eagles got two Mason Jones touchdown runs to provide they only scoring their defense needed. Silver Lake held Rossville off the scoreboard and under 200 yards of total offense. Central Plains League rivals Conway Springs and Garden Plain remain ranked No. 4 and No. 5 respectively in this week’s poll. Conway Springs outscored Wichita Trinity 62-35, while Garden Plain rolled past Belle Plaine, 71-14. Smith Center blew past Oakley, 62-6, and remain atop the Class 2-1A poll this week. The Redmen will travel to Ellis this week looking for a fourth straight win. Jefferson County North failed to score 50 points for the first time this season, but the second-ranked Chargers had plenty on the board in a 48-7 win over Horton. The Chargers will step away from the KSHSAA schedule this week to host Christ Prep Academy. Lyndon remains in the third spot after another Flint Hills League victory. The Tigers beat Council Grove 47-6 on Friday. Lyndon has its biggest to date at undefeated Osage City this week in a game that should decide the Flint Hills League title. Ell-Saline and Valley Heights flip spaces in this week poll. The Cardinals move up a spot to No. 4 after winning the battle of unbeatens in the Heart of America League, 14-6 over Hutchinson Trinity. Valley Heights falls one spot to No. 5 in this week’s poll. The Mustangs had no trouble in rolling to a 30-point win over Wabaunsee. St. Francis overcame a challenging week on and off the field to remain atop the 8-Man, Division I poll. A special school board meeting was called during the week where some expressed concern about retaining Rodney Yates as coach. The board retained Yates as coach despite several non-starters leaving the team. On the field, the Indians responded with toughness and a 16-8 victory over No. 5 Hoxie. Burlingame retains the No. 2 spot this week, barely, by a vote over No. 3 Spearville. The Bearcats blasted Onaga, 59-0, while Spearville beat previously-unbeaten South Gray, 48-2. 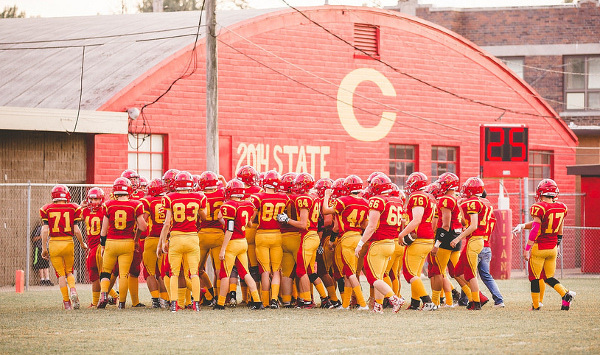 Burlingame gets a test this week when the Bearcats travel to unbeaten Clifton-Clyde. Osborne remains in the No. 4 spot after a 58-40 win over Solomon. The Bulldogs played without two-thirds of their backfield with Darnell and Darrien Holloway sitting out due to a violation of team rules. Unfortunately for Solomon, senior back Denton Schurr played. Schurr rushed for 465 yards and seven touchdowns in helping Osborne pick up the district win. Hoxie remains in the No. 5 spot despite the loss to top-ranked St. Francis. The Indians took an 8-0 lead in the game before giving up a pair of second-quarter touchdowns. Defending champion Hanover rolled to a 17th straight victory by shutting out Wetmore, 48-0. The Wildcats will be heavy favorites again this week when they return home for the first time since Week 1 to take on Blue Valley Randolph. Pike Valley remains No. 2 this week after a 56-0 shutout of Southern Cloud. The Panthers get a key district test this week when they travel to take on unbeaten Mankato-Rock Hills. Otis-Bison retains the No. 3 spot this week with a 70-24 win over Sharon Springs-Wallace County. The Cougars continue the challenging District 6 play this week with a road trip to Tribune-Greeley County. Hodgeman County defeated Tribune-Greeley County 60-14 on Friday to move to 1-0 in district play. The Longhorns will look to move to 2-0 in district play when they host Triplains-Brewster this week. Finally, Hutchinson Central Christian remains at No. 5 this week, but fellow District 2 member Caldwell is closing the gap. Central Christian routed Norwich 60-6 on Friday and travels to Hartford this week.